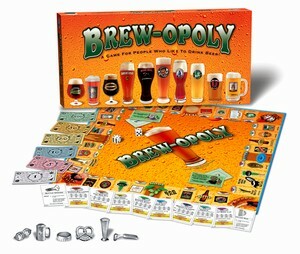 Here's a game for people who like to drink beer! Are you a pilsner person, a lager lover, a brown ale girl, a stout fellow, or is wheat your treat? Whatever your pleasure, from Alpha King Pale Ale to Zonker Stout, our nation's award winning microbreweries produce the suds that will tickle your taste buds. In Brew-Opoly, buy or trade your favorite beers and increase property value by purchasing Brewpubs and Microbreweries for your monopolies. Sounds easy enough until you have to put on your beer goggles and kiss your neighbor or stand and sing "99 Bottles of Beer on the Wall!" So choose your token and advance to Cheers! Who knows! You might be collecting money from every player for a beer run...or you may be chosen 'Beer Drinker of the Month!' For 2 to 6 adult players.